Let Rainbow Rubber Extrusions be your Viton™ Square supplier! Looking for Viton™ Square? We have a full line of Viton™ products available. Feel free to look around our website. Viton™ Square is often used for sealing, door seals, gasketing material and many other industrial purposes. High temperatures and harsh environments call for the use of Viton™ Square. Viton™ Square is extremely durable and designed to withstand extreme conditions. Like Viton™ Strip, Viton™ Square can withstand high temperatures of 400° F for extended periods of time and/or excursions up to 600° F for short periods of time. Viton™ offers one of the widest ranges of fluid and chemical resistance in comparison to other commercial elastomers. If you have a harsh chemical environment Viton™ Square is an excellent choice. 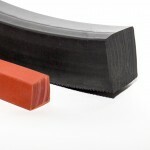 To place your order for any Fluroelastomer needs call us today at 330-848-2255.